Zambia : Ghana President: What has Africa done the last 60 years of independence? Home Economy Ghana President: What has Africa done the last 60 years of independence? Ghana President: What has Africa done the last 60 years of independence? 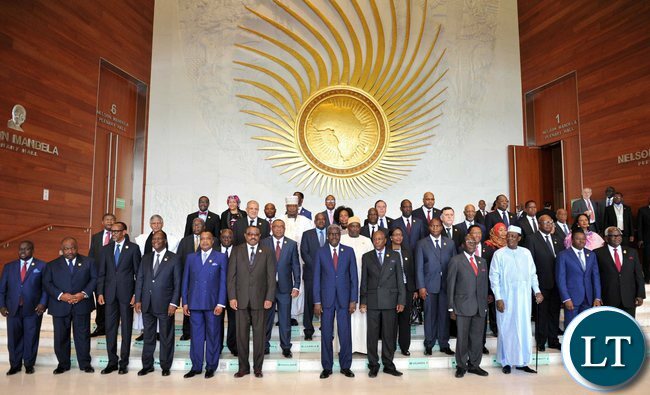 File:29th Ordinary Session of the Assembly of the AU. Hosting President Emanuel Macron of France on 30 November last week, Ghana President Nana Akufo-Addo said many things to his audience and host. But one key message was something like: What have African leaders done for the continent in the last 60 years of independence? He complained against continuous begging from Europe. For sure, at independence and many years after, most African countries planned their own national budgets with their own resources. But today, most if not all of them do not own their budgets because almost half of it is funded by foreign donors, leading to some to say that Africa has lost its soul. For example, “Agenda 2063, or the Africa that we want” is very good on paper. Yet, the African Union has no self-financing budget to achieve the goals. In other words, a large part of the funding will come from external partners. That is why the Ghana President is right. He called for Africa that believes in itself, an Africa that is economically self-reliant and provides hope and job opportunities for young people to own within Africa the same things that they are seeking as they migrate to Europe in order to prevent migration. But other African Presidents, whose governance is shrouded in a cloak of secrecy should say and act the same way and stop inflating the importance of their achievements which only they, and not the people see. They should emulate the courage and honesty of the West African leader. In fact, the African Union should put this item on its agenda whenever heads of state meet, to discuss, “Where did Africa go wrong? How can Africa restore some important economic achievements it made in the past? The purpose of this article is to use numbers to explain what the Ghanaian leader is talking about, and we use Ghana itself. What do we know about Ghana’s regional economic competitiveness? What do we know about Ghana’s global competitiveness in trade? Since I am a trade expert, let me use two simple trade indicators that may help us explain how Ghana has performed in its participation in international trade, given that it is one of the countries in Africa gifted with natural resources that it exports. Ghana exports Gold and crude petroleum as two key products. When the Ghanaian President complains and asks, “What has Africa achieved in the last 60 years of independence?”, again, it is better to look at his own country’s performance in international trade because trade is an important source of finance. As the President says, Africa is gifted with huge natural resources which it exports and should make the continent self-sufficient and stop asking for handouts. Yet, according to numbers, his predecessors disappointed not only Ghanaians but Africans. 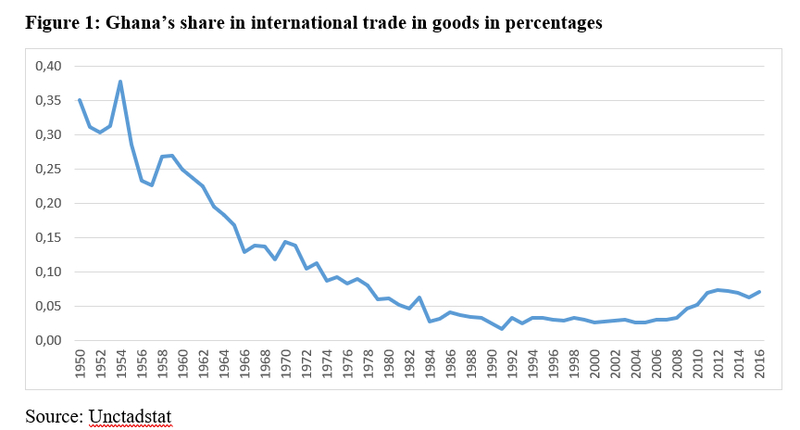 In the last 60 years that Ghana has been independent, it has lost its share in international trade drastically, from 0.23% in 1957 when it got independence to 0.07% in 2016 as Figure 1 below shows. According to the President, it is incomprehensible that a country blessed with many natural resources that it has been exporting to the world in the last 60 years has lamentably failed to compete globally. Instead of inheriting and maintaining a growing share of 1950 of 0.35% or in 1957 of 0.23%, which by today would have made immense contribution to the growth of the economy, create jobs and reduce poverty, leaders that presided over the country failed the people and allowed other countries in the world to grab the share while Ghana’s share went into the abyss of erosion. But Ghana is not alone. Most, if not all African countries lost their share in international trade in the last 60 years. We can provide numbers if asked. Kwame Nkrumah, Ghana’s first President called for a united African economy. But he unfortunately died without seeing it diversify or upgrade exports. I heard when I was at school that Malaysians used to go to Ghana to learn about export diversification of palm oil because the African country was more advanced then. 60 years after independence, Malaysia is exporting more value added products from palm oil than Ghana does. 60 years have passed since its independence and Ghana, inexplicably continues to export more primary commodities than processed products. 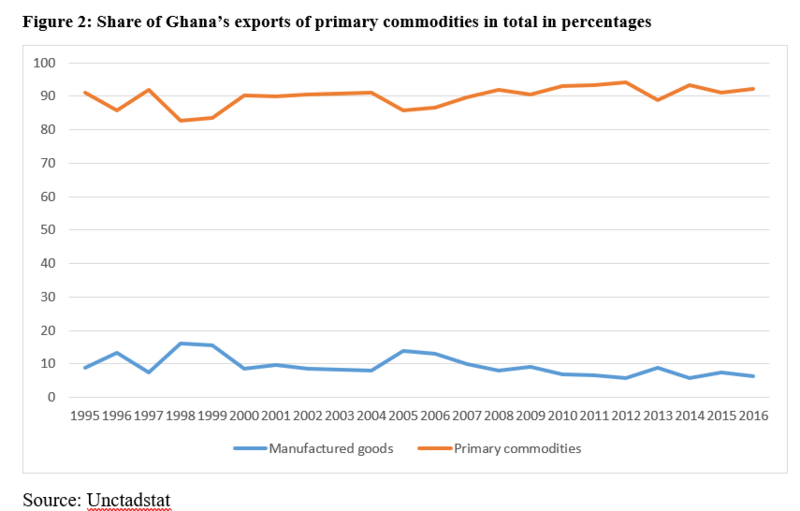 The image you see in Figure 2 below shows that in the last 20 years, despite repeated political calls to diversify and add value to exports, Ghana provides one of the worst examples of a rentier state, obtaining cash from exports of Gold and petroleum but refusing profusely to upgrade. The red line on top shows the share of exports of primary commodities in Ghana’s total exports to the world and this has been consistently rising from 90% in 1995 to 92% in 2016 while the share for exports of manufactured goods remained at below 10%. Like Angola, Equatorial Guinea, Sudan, Nigeria and Zambia, all rentier states, Ghana’s performance in upgrading its exports has been appalling therefore a very bad example of the Africa we want. The Africa we want must develop a culture of innovation, of upgrading, of moving into global value chains and networks, of ending the commodity dependence syndrome, of creating jobs, ending poverty and empowering its citizens to walk upright instead or downright in the world where its people will be respected and not looked at as beggars. We therefore hope before he leaves office, President Addo will be remembered differently from his predecessors who invested in more talk and showboating than action. The other question that President Addo asked was, “Why Africa falls behind Asian countries like Singapore of Malaysia whose economies 60 years ago were more inferior to some countries like Ghana or Africa? The unfortunate answer to his Excellency’s question is that it is no longer necessary to compare Africa’s performance with Asia. Instead, we now compare Africa with small countries like Viet Nam. As figure 3 shows for example, Viet Nam has overtaken the whole continent of Africa in exports of manufactured goods. In 195, Africa exported $ 28 billion compared to Viet Nam’s $ 2 billion. In 2016, we see that Viet Nam exported almost $139 billion relative to Africa’s $91 billion. Don’t cry for me, cry for yourselves and for your children. These numbers must be discussed in African Union meetings. Where did Africa go wrong? Why is Africa being overtaken by small countries? Why are we discussing irrelevant things in the African Union instead of real issues that our countries are facing? How can we learn from countries like Viet Nam? We can only learn by mixing with the country, yet there are only about five African countries with Embassies in Viet Nam. Ghana has a mission in Malaysia for many years, but what has the African country learnt from Malaysia in terms of upgrading their exports? Why do African countries have Embassies in countries that are experts in processing exports but are not learning anything? Why can’t African countries ask their Asian partners, using South-South Cooperation to learn how to upgrade exports as the priority goal of the Embassy? Now Africa has China, what is Africa getting from China? We prefer to ask for a state of the art African Union headquarters building in Addis Ababa from China instead of a building that trains young African entrepreneurs innovations, industrial skills, how to make toys, etc. When China finally leaves Africa in the next 30 years when copper, petroleum oil, Gold and other natural resources are dry, what shall we remember the Asian country for? Shall we remember that it built football stadiums, the African Union headquarters, roads and things which we can do ourselves? Ghana’s president should be asking what his own father did. Edward Akufo-Addo was president in the 70s and thus his own family is part of the rot. Ghana at least appears somewhere on that list. Zambia does not. This is exactly what Col M. Gadaffi was killed for..where was the AU when Libya was being torn apart? where is the AU when Libya is now in ruin..Greedy African Politicians. Nigeria is a joke ..please remove them from there where in the world does a President disappear for three months to a London private hospital and comes back like he never went away. Most of those escaping to Europe via Libya come from Nigeria…that should tell you its own story!! You’re so right about Nigeria. It should be the most useless country in Africa. Most of those trying to escape and go to Europe via Libya are Nigerians. What the F**k is wrong with Nigeria? A country so blessed with resources has always been ruled by dogs resulting in Nigerians being economic refugees around the world. @general Kanene – They can not be Zambians in Libya doing what? Do you know how much it costs to get there…better going to RSA!! Look who’s talking. He’s just talking for the sake of it. The guy just reads speeches as they are given to him without knowing the content. Isn’t this the same guy who plagiarized George Bush’s speech and used it as his inauguration speech? The guy is so dependent on the west that he even gets speeches from America. He’s talking about African countries using their own resources to fund their budgets but he depends on America for his speeches. How shameful. I can’t listen to a character who fails to find his own words to express himself. Someone tell this man that Africa is not and will never be independent because a White man will never allow that to happen. Look at the people who have tried to divorce Africa from Europeans and attempted to develop their own countries: Robert Mugabe, Muammar Ghadaffi, Levy Mwanawasa, Thomas Sankara. They are either demonized as Dictators or assassinated. That is your problem you people, your minds are not free from blaming the white man. If Vietnam or Singapore or Malaysia have made, why you Africans can never make it? Are you telling me its because Vietnamese is slightly whiter than an African? With such mentality, we will continue to be in that “hole”.You are just lying to yourself, trying to find excuses. Who demonized Levy Mwanawasa???. Mugabe created problems for his country, if he was smart he could have resolved the land issue differently. Muammar Ghadaffi created problems for himself, it’s not because he wanted free Africa. But simply he had blood on his hands. Thomas Sankara, ask yourself, how did he come to power? Tomas was eliminated by powerful Burkinabe middle class, the tribal leaders whom he stripped of the long-held traditional right to forced labour and tribute payments. Thomas Sankara once said “he who feeds you, controls you.”, that is what he stood for. Now, who is forcing Zambians to borrow? What steps has Zambia or Africa taken to be self-reliant? You have thieves in your leaders, who when in power are focussed on amassing wealth leaving their countries to bankruptcy, which lead the countries to borrow. Thomas Sankara once sold government Mercedes Benz and opted for a Renault 5, slashed off his salary. Tell me of any African leader who has done that? Besides TZ. @general Kanene I have to agree with you. The problem stems from the Mindset! No one else is or should be to blame except the stupid African who allows himself to pay taxes be it through VAT or whatever when there is zero service delivery, the stupid African who keeps quiet as his leaders he elected waste money on luxury SUVs when there is no medicine in the local clinic. Africans are just a curse onto themselves, look at Nigeria and Congo! Basket case countries resource rich but backwards in terms of development because of the stupid people who live there!Honesty is the first step in solving problems! Let’s be honest and address the curse of the African mentally! Also poor bcuz people like you have poor self image and lack self belief. A good friend once said you all try so hard to show us that You are intelligent by proving that an African stupid. My brothers fear not Africa’s dawn is coming just believe in it and work hard for the sake of your nations and our continent which we love so much, that’s why we are here so let’s do it. Sure situation seems very desperate and insurmountable but we will overcome fear not, it usually gets worse before it gets better.